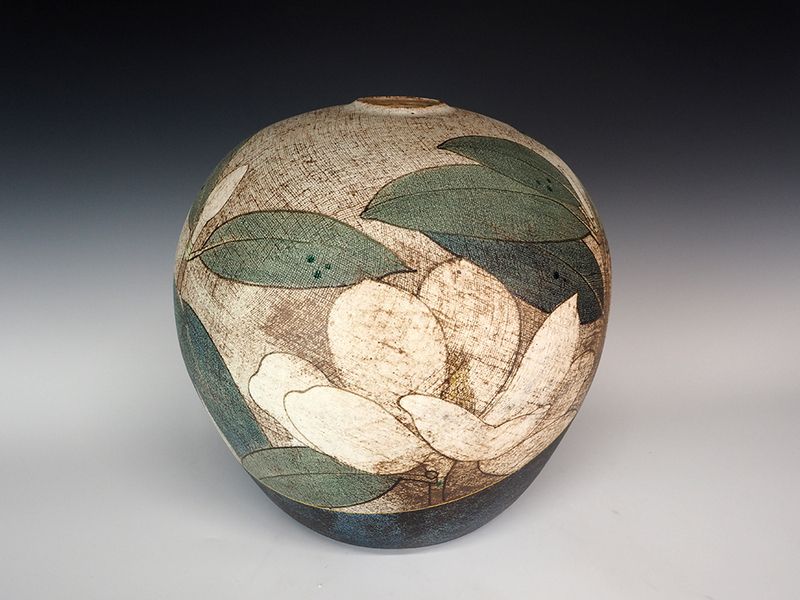 ITO Motohiko | Nunome Technique Magnolia Jar — Dai Ichi Arts, Ltd. The bounty of nature available in Japan ensures that each new season brings a different kind of beauty. Japanese artists harness the transformations of the seasons, translating nature’s beauty into works of art. Ito Motohiko’s ceramic works become canvases for his gorgeous paintings of the natural world. 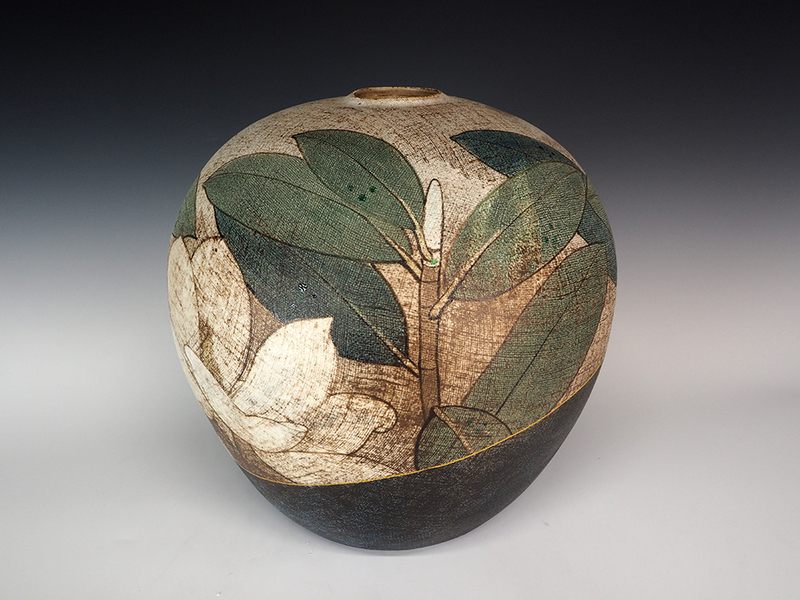 Fields, flowers, and fallen leaves grace the surfaces of his masterful pottery, enhancing the graceful lines and traditional forms of his work. The four seasons grow and blossom across Ito’s work: fall’s waving Susuki grass graces small plates, winter’s happy camellia blooms in bushes heavy with snow on an impressive vessel, spring’s sweet cherry blossoms cover grand vases, and summer’s fig leaves spread across a large platter. His naturalistic style radiates a calm sense of beauty, one in line with the artist’s goal of spreading peace through his work. The artist received a BFA in 1964 and an MFA in 1966, both from Tokyo Art University, where he studied with Kato Hajime 加藤土師萌(1900-1968) and Fujimoto Nodo藤本能道(1919-1992). He worked at a tile company after graduating, but quit after two years to continue his studies, first with Matsui Kosei and then at the Ibrarki Pottery Research Center. He established his own kiln in Kasama in 1970, and has since received many awards and accolades, including a solo exhibition at the Ibaraki Ceramic Art Museum in 2001.